The UN calls it ‘the world’s worst humanitarian crisis’. 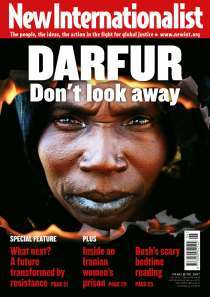 But what is causing the violence in Darfur, and why hasn’t the world acted to stop it? A letter from inside prison by Iranian women’s rights campaigner *Mahboubeh Hossein Zadeh*. The African cinema lion roars! Ten day festival of African cinema in Burkina Faso.